...until I was done writing my book to tell everyone. Here’s the deal folks, in order to become a writer you have to do one thing above all: Write. You see, it’s not so much that I didn’t want anyone to know, it’s just that I believe that if you start telling someone you are going to write a book, then writing itself becomes a chore. If you tell someone, then it becomes an expectation. It’s a trap I think many writers fall into. And if writing becomes a chore more than a passion, then they don’t write. And in order to become a writer, you have to write. In order to get good at writing, you have to write. Notice a pattern here? Now I’m not saying that all of this is fact. It is just what I believe and it’s the realization that I’ve come to as to why I never told anyone. If writing becomes a chore, then you give up before it can become a passion. The first book is hard. Believe me. If it was easy, then everyone would be doing it. If you want to write, then write. Write, write, write. Write until you find your voice. Write until you find your soul, your characters, their feelings. Write until it becomes good, and if it’s not, write some more. For the longest time I was afraid to tell anyone. But now I think I can confidently say: I am a writer. 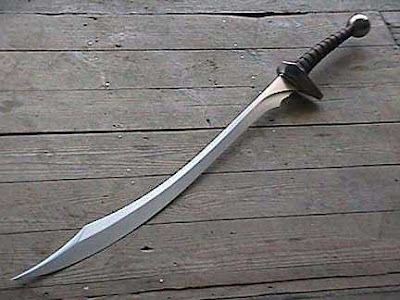 Make this a dagger and I think I found the weapon(s) of one of my main characters. It usually strikes at the worst times. Early in the morning when I can't sleep, or late at night before falling asleep. When I wake up and try to go back to sleep. (Notice a pattern here?) Now, late night writing sessions aren't unusual. It's when I get most of my writing done, even into the wee hours of the morning when all the world's asleep and there is no one to disturb me. But it's those times when I just want to switch off, that I just casually start to think about a scene, or a character, etc. that ideas come flooding in. Dialogue starts to form. Actions play out. Introspection is realized. I try to tell myself that I'll remember it tomorrow, or when the time comes for me to actually write the scene. However, I know that's not the case. I will forget. This is why I keep a notebook and a pen next to me in bed. My sheets are filled with ink stains. (Finally got rid of that pen.) I now have several notebooks filled with scenes and ideas and late night scribble that I can't decipher. Maybe this is why I am tired all the time. It's the price I have to pay for this madness. But I will pay it gladly. ... when I read the same paragraph or sentence over and over again, and when I get to the end, I still don't know what I just read. Distracted reading is bad reading.